The kid’s a natural. No doubt about it. That kid is a great-nephew, one of my brother’s grandchildren. Young Nicholas Vang doesn’t have a lot of mileage on him, but he has talent and inclination for the great outdoors, and with his uncle Dan showing him the way, I see a lot of great outings in his future. This spring, Dan called in a wild turkey gobbler for Nicholas, and now he’s taking him fishing at every opportunity. In April I wrote about the first Earth Day and the landmark environmental legislation that followed, such as the Clean Air Act and the Clean Water Act. American waters responded to cleanup and rivers and streams that were all but dead when I was a kid now run clear and nurture abundant populations of game fish. The Zumbro River, which runs through my hometown of Zumbrota, Minnesota, is definitely one of them. My nephew, Dan Vang, lives on the banks of the Zumbro River, just a mile out of town, and just down the hill from where one of my uncles (this story, it seems, is all about uncles and nephews) lived most of his life. Dan is an outdoors enthusiast, and his home is filled with antlers, mounted deer heads, and sporting art from a lot of ducks and pheasants banquets. There’s a pheasant pen in the back yard and then there’s Gus, Dan’s big yellow Labrador retriever. As for the river, there are not only smallmouth bass in the stream; there are trout and even muskies. I looked forward to fishing the Zumbro until heavy rains turned the stream high and muddy—just like our Montana streams are right now. When Dan and Nicholas came to pick me up, he suggested we put a canoe into a tailwater, a stretch of the river downstream from a hydro dam. It was raining when we launched the canoe into the river, but the water was crystal clear and running swiftly over gravelly riffles. Dan and Nicholas were casting lures with spinning rods while I used a flyrod. Smallmouth bass are notorious for liking warm, sunny weather for working up a good appetite, and this definitely wasn’t a great day, but it didn’t take long before Nicholas called out, “I’ve got one!” He held up a juvenile smallmouth that flipped off the hook before I could take a picture. Drifting a streamer across a riffle, I felt a little tug on my fly, and then landed a smallmouth of my own, which set a personal record for me, as undoubtedly the smallest bass I’ve ever caught. It was all of two inches long. 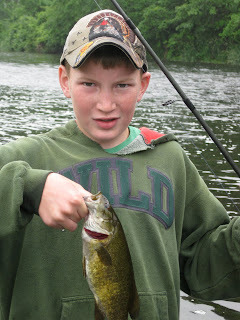 A little later, Nicholas called out, “I’ve got another one!” He held up another bass, this one obligingly staying on long enough to be photographed, before Nicholas expertly released the fish back into the water (a catch-and-release area for smallies). Nicholas was wearing knee-high rubber boots and a rain suit, though it didn’t keep him dry as he waded into waist-deep water to cast towards a seam in the current on the other side of the river. After we finished our float downstream to the takeout point, he just laughed as he dumped a couple quarts of water out of each boot. That evening I suggested a short lesson in flycasting. Nicholas watched intently as Dan hesitantly made a few casts. When I handed the rod to Nicholas, there was no hesitation. He made a false cast or two and then proceeded to make powerful 30-foot casts without a bit of difficulty. “We’ve got to start flyfishing,” he informed Uncle Dan. Flyfishing, of course, is one of those specially paved and highly polished routes to perdition. You start off just wanting to catch a few fish and then, before you know it, you’re tying flies and bass bugs, building rods, studying aquatic entomology, and going to Trout Unlimited meetings. It’s a life that’s suddenly more complicated. Though the distances between Montana and Minnesota will make it a bit difficult to watch Nicholas learn these new outdoor skills, there’s no doubt he’ll do well. The kid’s a natural.